1998 Winner of the Cyril O. Houle World Award for Literature in Adult EducationIn this thought-provoking book, Quigley offers a new view of illiteracy that starts with the learner and takes into account a broad array of work, family, and cultural considerations. This guide gives adult educators and trainers working in the field concrete suggestions and alternatives for their work that they can use to shape a new philosophy of adult literacy and improve their practice. B. ALLAN QUIGLEY is associate professor and regional director of adult education at the Pennsylvania State University Center for Continuing and Graduate Education, Monroeville, Pennsylvania. 1. Myths, Rhetoric, and Stereotypes About Literacy. 2. The Popular Perspective and the Media. 3. The Political Perspective and Literacy Programs. HOW TEACHERS AND ADMINISTRATORS VIEW ILLITERACY. 5. What Textbooks Can Communicate to Learners. 6. Understanding Attrition and Improving Retention. 7. Why Many Resist, and Ways to Recruit Them. 8. Grounding Programs and Policies in Practical Knowledge. 9. 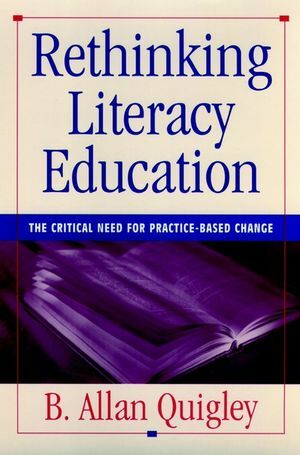 Literacy Educators as Leaders of Effective Change. TAKING ACTION TO TRANSFORM LITERACY EDUCATION.